HOUSTON (KTRK) -- Texans fans are gearing up for the big game Saturday and trying to stock up on championship shirts and hats. Most stores sold out quickly Sunday and Monday morning, though. Harold Eastland drove to the Texans store at NRG hoping to buy some gear, but he left empty handed. "This is like my third stop. I went to Academy over in Pearland, 290 and Tidwell, and I was like, wow, let me go over here," Eastland said. The Academy Sports and Outdoors store near Kirby had a handful of child-sized championship T-shirts for sale Monday afternoon. "This is what I came here to get," Marion Jones said. "I drove all the way from Stafford to get these." Texans players say they appreciate the support and loyalty from their fans. "They don't give up on us," DeAndre Hopkins said. "You know, we can go 2-5 like we did, and they're gonna pack out the stadium." Cornerback Johnathan Joseph said fans' energy makes a difference in how they play. "We feed off their energy. Because when they get excited, it tends to get us a little more pumped up," Joseph said. This is the first time in decades that all three professional sports teams in Houston made it to the playoffs. "We're definitely trying to bring a winning culture around here," Texans linebacker Brian Cushing said. Fans like Harold Eastland said it's an exciting time to be a sports fan in Houston. Eastland plans on coming back to the Texans store at NRG Tuesday morning. He hopes to get his hands on championship gear before the game Saturday. Store managers at various Academy Sports and Outdoors stores in the Houston area expect new shipments of championship gear to arrive Monday night or Tuesday. 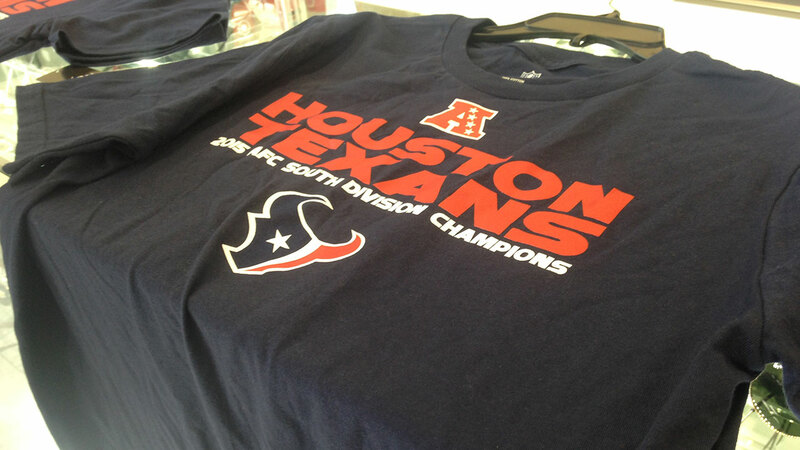 The manager at the Texans store at NRG is also expecting a large shipment to arrive soon.